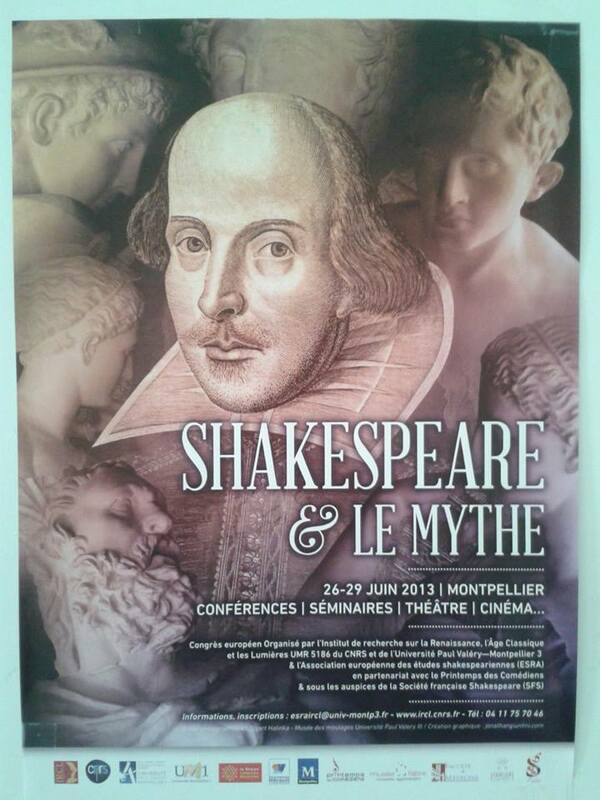 8-17th May 2015 sees the First York International Shakespeare Festival and York St John University are proud to be hosting two great events. Leading multi-cultural company Two Gents Productions are bringing their interpretation of The Taming of the Shrew to York, and their founder and director, Arne Pohlmeier, will be working with a small group of primarily YSJU students in front of an audience to demonstrate their unique methods (however, we have a few extra places so contact me via Arts Events if you would like to be involved in the demonstrating: artsevents@yorksj.ac.uk). Working with a cast of just two actors of migrant /cross cultural backgrounds, their work was hugely successful as part of the Globe to Globe Festival in the Olympics celebrations in 2012, and Arne is now also working with Shakespeare’s Globe on a regular basis. This is an amazing opportunity for participants and audience alike and is a FREE but TICKETED event. 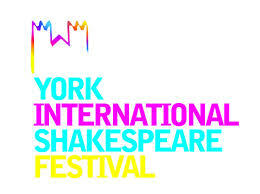 In fact, why don’t you make a day of it and attend the discussion panel in the afternoon, featuring among others, the Festival organiser, Philip Parr of Parrabola, Dr Aleksandra Sakowska of British Friends of the Gdansk Shakespeare Theatre, Natalie McCaul of the York Museum Trust on curating the First Folio, Maurice Crichton, York Shakespeare Project, David Richmond on his current student production, They Kill Us For Their Sport, a response to the students’ recent visit to Auschwitz, and Shakespeare: Perspectives lecturers, Saffron Walkling and Julie Raby. Also FREE but TICKETED. 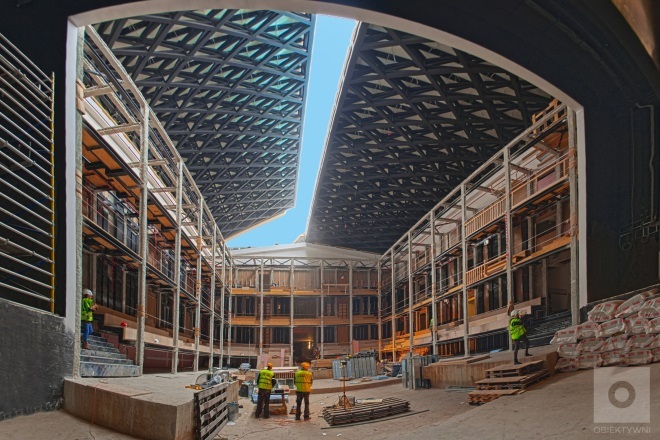 On the 19th September 2014 the Grand Opening of the Gdańsk Shakespeare Theatre will take place. It is one of the most unusual venues in the world and the only modern theatre building with an opening roof that allows the staging of plays in daylight, in the tradition of the Renaissance. 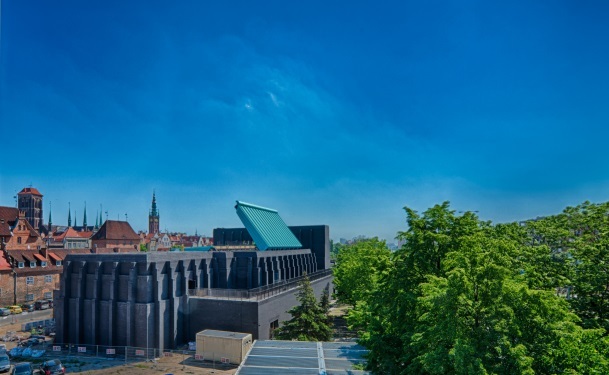 This is an exceptional event as the Gdańsk Shakespeare Theatre is the only dedicated theatre building that has been constructed in Poland for almost forty years. Therefore the Grand Opening ceremony will gather many notable persons from the world of culture and business, as well as government and local authorities. 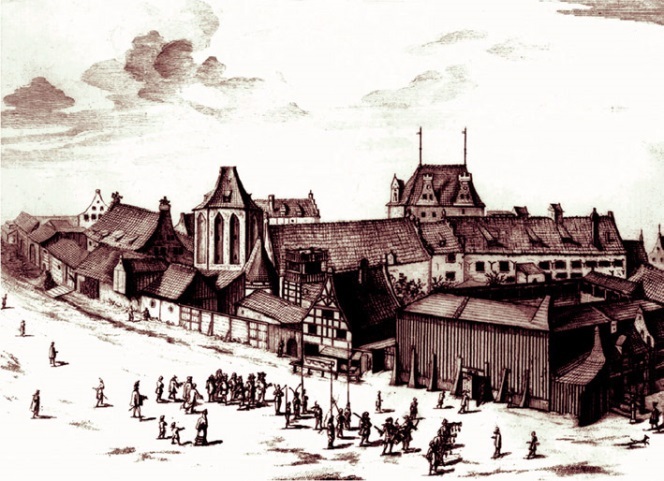 The Fencing School is thought to be modelled on the Fortune Theatre, an Elizabethan playhouse in London, as shown in this engraving by Dutch artist Peter Willer from the second half of the seventeenth century. The so-called ‘New Fencing School’ was constructed by Flemish craftsman Jakob van Blocke in 1635. No information has been preserved about the earlier ‘Old Fencing School’, built circa 1610 where English travelling actors performed during Shakespeare’s lifetime. The idea of the Gdańsk Shakespeare Theatre, a modern reconstruction of the Elizabethan-style Gdańsk playhouse, where English travelling actors performed in the seventeenth century, was born under the patronage of HRH Charles, Prince of Wales. Other notable supporters of the project include renowned Polish film director Andrzej Wajda, celebrated British theatre director Sir Peter Hall and many leading British and Polish actors, among them Ian McKellen, Dame Judi Dench, Emma Thompson, Allan Rickman, Kenneth Branagh, Krystyna Janda, Jerzy Stuhr, and many others. Because the building cannot accommodate all the guests we would like to invite, the Grand Opening of the Gdańsk Shakespeare Theatre will take place in two stages: a closed ceremony will take place inside the theatre with VIPs, sponsors, foreign guests and journalists. All other festivities will take place outside the building for other guests wishing to take part in the celebrations. 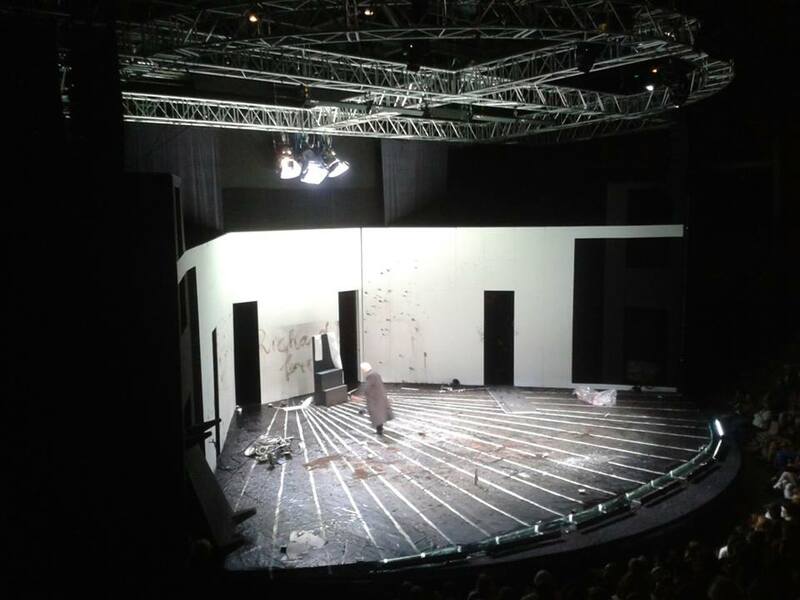 The interior of The Gdansk Shakespeare Theatre configured with the Italian box stage. 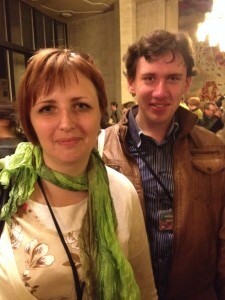 (c) ASP Obiektywni. include a Spanish fencing show and a performance of aerial acrobatics. The performance will close with a march of all the spectators, led by the fencers and actors, through the Theatre’s Main Hall, where they will be welcomed by Shakespearean characters. design with its unique architectural and technologically advanced elements – created with daring and ambition – such as the opening roof which provides daylight during performances and a retractable modular stage design providing both an Italian box stage and Elizabethan thrust stage. The Gdańsk Shakespeare Theatre will become a vibrant centre for culture and the arts. Its forthcoming programme of events will include: a series of week-long events celebrating European culture (starting with the British Week from 20 until 26 September), a series of month-long events devoted to Polish theatre, an extensive educational series for primary and secondary schools, and finally the annual International Shakespeare Festival, currently in its eighteenth year, which will take place from 27 September until 5 October 2014. 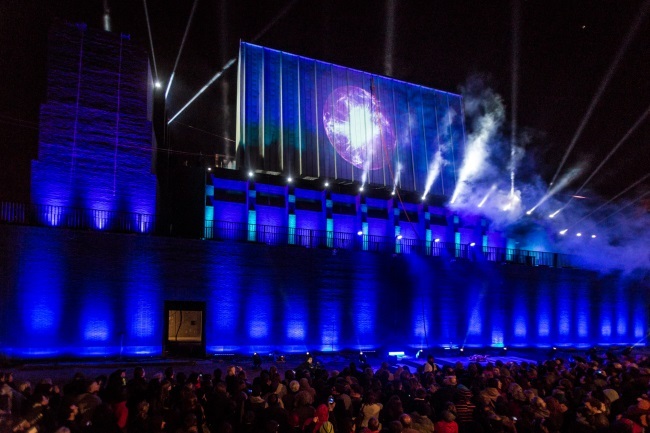 The distinctive combination of historical tradition and modernity makes the Gdańsk Shakespeare Theatre not only a unique tourist attraction but also a new international cultural platform dedicated to theatre innovation and artistic creativity. 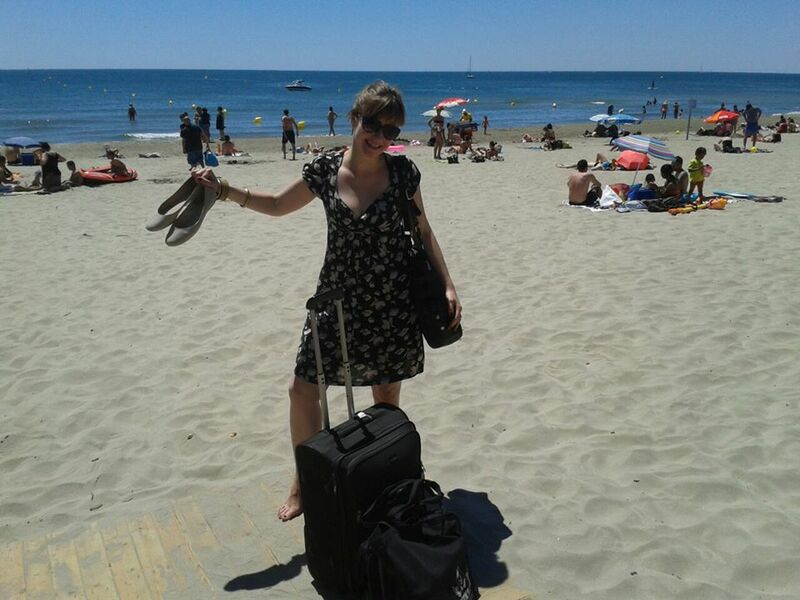 As a colleague put it: ‘four days of sun, sea and Shakespeare’ in the beautiful South of France city of Montpellier. 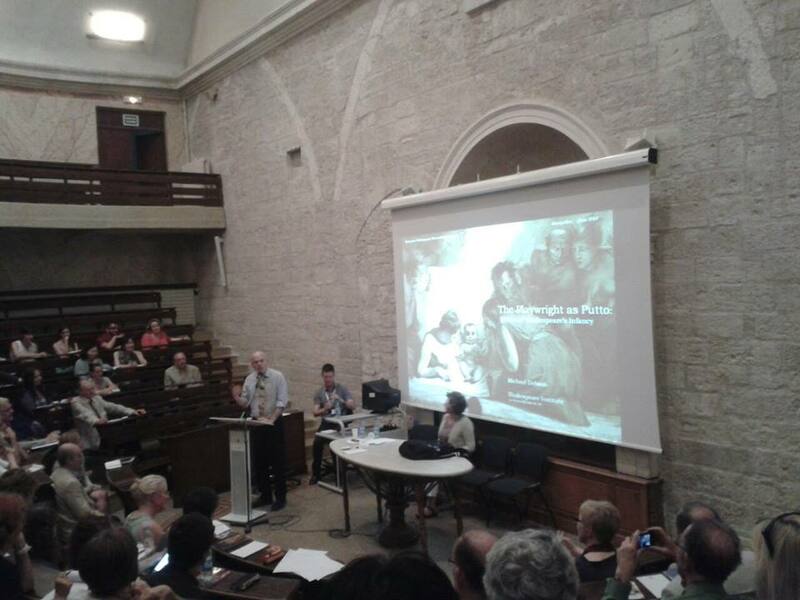 I’m discussing my paper ‘Denmark’s a Prison: Appropriating Modern Myths of Hamlet after 1989′ on Friday in the Shakespeare and Global Myths seminar convened by Alex Huang and Aneta Mancewicz, but today I’m off for a stroll around Domaine d’O, where there will be an opening reception in the grounds of the 18th Century house, home to the Printemps des Comediens Festival. It will be wonderful to meet up again with Dr. Nicoleta Cinpoes, who organised the Worldwide Hamlet conference in Craiova in 2009 where I first met many of these people. As people gave their papers in that industrial Romanian city, which also hosts a major international Shakespeare festival every two years (and we act like the World Shakespeare Festival was a new idea! ), there were definite recurring themes – of which Hamlet and the legacy of 1989 in post-communist spaces was particularly potent. This panel will explore Bulgarian, Romanian, Hungarian, Polish, Lithuanian and Yugoslav Hamlets. 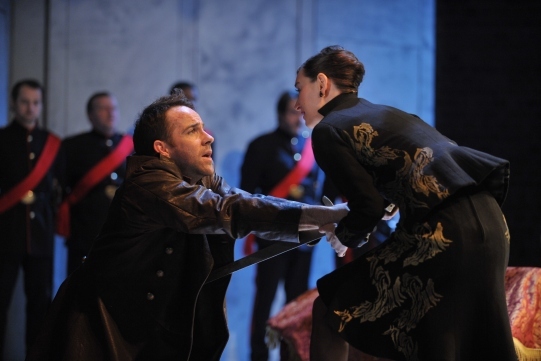 The importance of Eastern European reconfigurings of Hamlet was illustrated during the Globe to Globe Festival when Shakespeare’s most famous play was performed, not by the Brits, but by the Lithuanians (left). My blog review of Nekrosius’ Hamlet can be read here. My performance review of a Polish Hamlet directed by Monika Pęcikiewicz is forthcoming in the journal Shakespeare and is published online already. If you would like a free copy please contact me and I will send you the link. It originally started life as a couple of Shakespeare Travels blogposts, of course. Other speakers will include the ever eloquent Prof. Dr. Boika Sokolova, Dr. Sonia Massai, and Aneta herself, among others. Boris Godunov, the first in this trilogy of world classics that I saw, is a translation of Pushkin’s 1825 play about the rise and fall of one of Ivan the Terrible’s Oprichniki, or secret police, who takes the regency during the short reign of Ivan’s ‘cretin’ son, and is rumoured to have murdered the rightful heir to the throne, the boy Prince Dmitry. Boris is challenged by a bored young monk, Grigory Otrepiev, who, on learning that he would be the same age as the dead prince had he lived and has the same colour eyes (brown! ), decides to leave the cloisters and set himself up as pretender to the throne with the help of Russia’s old enemies, Lithuania and Poland. 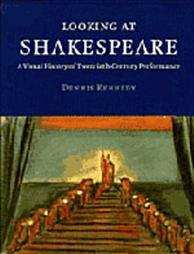 Pushkin, the programme tells us, deliberately chose ‘ a historical period that resembled that of Shakespeare’s History plays, a lead character that echoes the guilt-ridden Macbeth and a cunning Richard III, and a style and structure that juxtaposes comic scenes with the main action of the tragedy’ (p.9). Gudonov’s children, Ksenya (Joan Iyiola) and Fyodor (Christian Leith) were interesting touches, further humanising the central character. Ksenya, in perpetual mourning for her betrothed, a foreign prince she had never met, held his empty picture frame throughout, at one point dancing with his imagined image (Sui Hun Li). Little Fyodor seemed to reappear to his father as the apparition of the cut-throated Prince Dmitry until he and the audience realised that the child had been playing with red paint and a paintbrush. Yet this was billed as a comedy about tyranny, so the boy’s stunt brought a laugh. The fickle crowd added to the satire, and Susan Momoko Hingley, as the woman bashing her baby, first for crying in times of joy then again for not crying when the crown mourned, was very funny indeed. The late Adrian Mitchell’s script was brilliant, crackling with acerbic wit and, at times, hilarious doggerel, such as when the two drunken monks coerced the young runaway Pretender, Grigory, to speak in very bad rhyming couplets, much against his better judgement. However, the dialogue was rarely delivered with the energy of the text – a directorial decision perhaps rather than a lack of nuance on the part of the cast, particularly as the same actors bristled with energy the next night in Doran’s The Orphan of Zhao. Michael Boyd’s Boris Godunov was a concept driven production, entirely in keeping with Eastern European theatre traditions he trained in yet, unlike many Eastern European productions of the classics, not quite able to match its visual ideas with its verbal delivery. This was because, although adapted into contemporary and often colloquial English by Mitchell, the lines were mostly delivered in the careful, measured tones of traditional Shakespeare-speak: a little too slow to get the laughs, a little too enunciated to bring out any emotional nuance. Grigory, by contrast, shouted a lot. Again, this declamatory delivery of ALL his lines seemed to be on purpose, perhaps with Boyd intending to set him apart as the charismatic and passionate young rebel. In reality, the overall effect was that the dialogue was either sluggish or shouty, with the exception of Lucy Briggs-Owen as the slightly bonkers, power-heady Polish princess love-interest, Joan Iyiola as the mournful Ksenya Godunov and James Tucker as the deliciously slippery Prince Shuiskin. 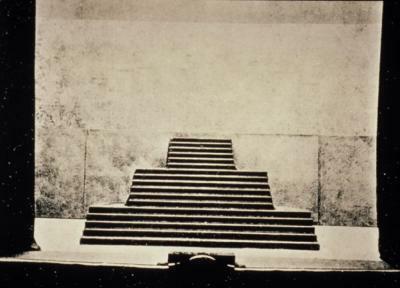 Likewise, although the Swan’s thrust stage allows for a real sense connection between audience and actor, and although the production utilised the space fully, with characters appearing amongst the audience, the more agile of the cast climbing up ladders into the galleries, the lack of direct eye-contact throughout meant that the fourth-wall was replaced with what I term the ‘goldfish bowl’. It was only in the final moments that the audience was called on to respond as if we were the Moscovite crowd, complicit in the endless cycle of tyranny, and by that time it was too late – instead of rapturously applauding the reign of Grigory, we simply politely applauded the end of the show. So despite its fine visuals, the pacing and its lack of connection to the audience, allowed its energy to seep away, so that ultimately it was never entirely engaging as comedy, tragedy or satire. As an afterthought, I wonder whether, if Boyd had gone for Boris Godunov as a satire on the last British election, it may have hit home more effectively?! Step by Step Richard III: from Jessner to Jonjo. Notes from my presentation on the Study of Shakespeare, YSJU. Or, as Paul Klee would sum up: ‘the more terrible this world, the more abstract our art’ (cited in Kennedy, 1993b: 83). See Dislocation, Dislocation, Dislocation for more on this. 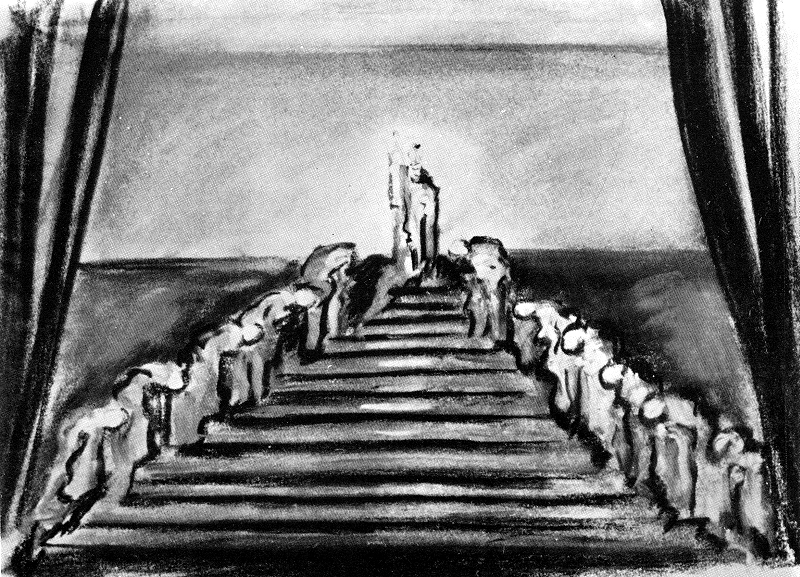 The relationship between the scenography and the bodies of the actors on the stage took on added significance when looked at through Pirchan’s coloured sketch, the only colour image that exists of this part of the production, I believe. Yet mise-en-scène extends beyond the visual surface of the play to embrace all aspects of how the play communicates meaning to its audience. Non-verbal communication includes intonation, timing, expression, gesture, spatial relationships between performers and spatial relationships between performers and the audience (see Leiblien in Kennedy, 1993a). My colleague, Julie Raby, had explored some of these ideas in a previous lecture in relation to the RSC’s recent summer production of Richard III, directed by Roxana Silbert. In this clip students had been particularly impressed with how the actor, Jonjo O’Neill, like a latter-day Vice, had seduced the viewer (and on the stage, the audience) into being complicit in his actions through his direct address. One student noted the way he walked away, and then turned back on the phrase ‘But I‘. As he confided in her his sense of being a rejected outsider because of his deformity, his seduction, it seemed, was complete. If it’s not just the words but the relationship between the words and the body that speaks them, however, that makes the meaning, then O’Neill’s Northern Irish accent as Richard was significant because it made a statement about ownership of ‘the Bard’ both on the part of the actor, who is Northern Irish, and the RSC, who produced the play. As a visiting American student said to me last year, after he had been praised for his reading aloud, ‘But I don’t sound like Shakespeare – you sound like Shakespeare.’ What if David Tennant had played a Scottish Hamlet? A small choice has big cultural implications. However, to people in the audience of my age, there may have been another layer of meaning perceived in O’Neill’s rendition, because to anyone who lived in the United Kingdom in the ’70s and ’80s, a Northern Irish accent was inextricably linked through the media to the Troubles. In fact, under Thatcher, the government literally tried to silence certain Republican and Loyalist figures by outlawing the broadcasting of their voices. Journalists got around this in a surreal manner, so that I grew up with Gerry Adams of Sinn Fein routinely dubbed by an actor speaking with a strong Belfast accent. Even if there had been no intended link in the minds of anyone involved in the production, the circumstances of history, and the Othering of certain a certain group through their voices, would still echo on the 21st century English stage. Finally, with the National Theatre of China’s appropriation of this play during the Globe to Globe season, we’ve seen how mise-en-scène extends to the language of the translation and the language of the theatre codes of whichever tradition a production is appropriated into.